Week 31 This week we get the last few bits to finish off the second planking. 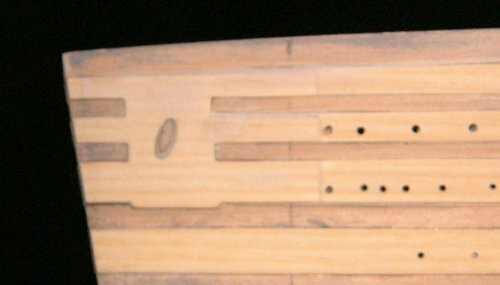 NOTE : In the parts list in the magazine you are told that there are 13 wood strips. This is a printing error, there are only 3 strips. This will be sufficient to complete this weeks work on the model. These parts were all glued in place as per instructions. 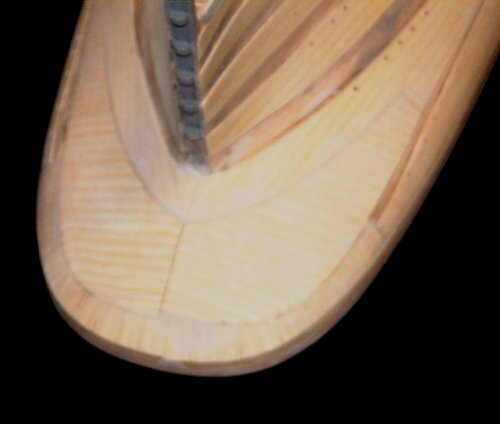 Take care to line up the bow parts carefully, and make sure that the hawse pipes (anchor chair holes) are both the same distance from the bow. The stern parts were slightly trickier to fit, but went on OK with superglue. They needed a bit of filling and sanding to tidy them up. 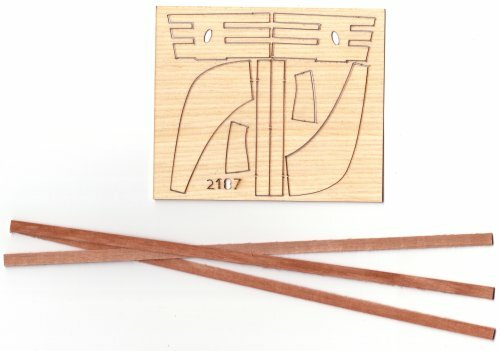 The strips of wood were plain sailing - just follow the instructions. Now we come to the filling and sanding which is very time consuming. Well, the sanding is fairly easy. Use fine sandpaper and smooth down the joins and any rough bits. Then take your favorite filler and fill any gaps between the joins. Be sparing with the filler. If you've got any places where the planks are slightly different widths or haven't joined perfectly I've got a little trick for you. Take an off cut from the second layer planking wood (you did keep some off cuts, didn't you ?). Cut/sand a straight edge and then rub it with a candle. You'll now have a bit of wood which filler won't stick to. Place it along the mis-matched join and then fill the gap with filler. Carefully pull the wood away and you should be left with a neatly filled join that will just need a light rub with sandpaper. I found that the bow pieces were narrower than the planks and needed this to neaten them up. This is quite time consuming, but worth the effort. Here you can the the 'before' and 'after' pictures of the bow planking. ... and here is the stern. 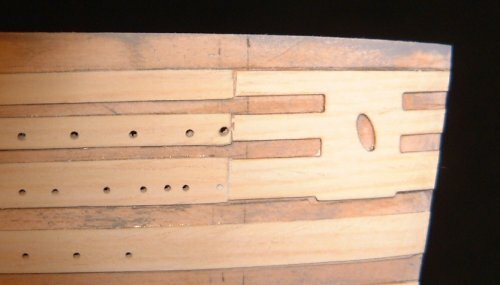 You can also fill and re-drill any portholes that are out of line. Just a reminder to keep off cuts of all the different types of wood - you never know when they will come in handy.